Hello my name is Carole and I'm the one behind McCheek's Mayhem Ceramics. I live in Houston, Texas with my american husband Sean and our three cats that keep life very interesting. You can check our home tour here. I first started making ceramics when I was a teenager in Scotland and went on to art college in London to do a degree and postgraduate in the subject. When I was a kid I would love making things and spurred on by Blue Peter and my granny I would make things out of corn flakes packets, make shell crafts and generally get into making three dimensional things. After doing several different things at the end of college, including running my own lighting business called Candy's Chandies I took a trip to America to do a road trip with my good friend Rhonda and met my now husband Sean who is from Texas. 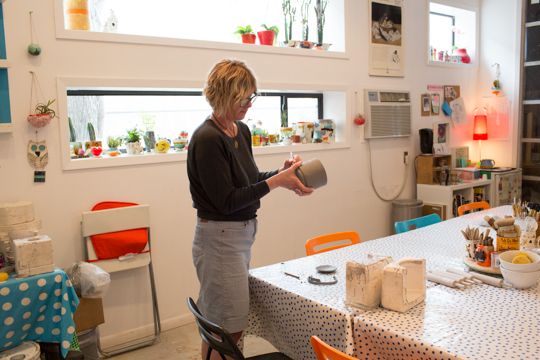 I eventually moved to Houston and got back into making ceramics when I did an art residency. I started making functional ceramics as I wanted to make things that people can use. I began by collecting cups and mugs from thrift stores and making moulds of them and reproducing them in a contemporary way. I really love working with clay, you can do so much with it and I'm really into the way you can transform a piece of basically mud into a cup that you can drink your coffee out of. The firing process has always been magical for me and I still get excited about opening the kiln to see what's inside, every time! I use a lot of moulds to make my work (and have an almost hoarder mentality around them). I slip cast and use slabs of clay and recently started making pinch pots too, I am very much into the process of making my work and would find it hard to have anyone else make it for me. I think my sense of style and colour lets people know it's a McCheek's Mayhem piece. I love bright colours, things that remind me of having tea with granny when I was little and I hope that my sense of humour is translated into my work. Recently I've been trying out new glazes to see what else I can get to work and recreating a long lost ' seventies' look. The idea to start my business McCheek's Mayhem came from wanting to sell my work after doing the odd craft market and realizing that people liked what I made, so when I started my Etsy shop I wanted to have people be able to see my work around the globe. I love traveling and sending my work to other countries has always excited me, it feels like a part of me is going there too. For a few years I worked in the restaurant business and when I finally decided to jump off the deep end and do this full time, I felt a big sense of relief- that I was finally doing what I was ' meant' to be doing, after a long time of searching for that. I hope that my customers will be happy to see and use what I've made, it really makes me feel good when people tell me they love eating soup out of a bowl I've made or drink their morning coffee out of their favorite mug. I feel lucky that I'm able to do what I love as my business. I get to make things all the time, as well as teach people to make things in my teaching studio - McCheek's Academy. I have my own schedule and I also have a beautiful new studio right next to my house which is incredibly handy. In case you're wondering, the name ' McCheek' references the 'Scottish and cheeky' part of me, and the ''Mayhem" part is because there usually is some kind of mayhem around in this funny creative path I've chosen.